TUNE IN (2nd Edition – Revised and Expanded) is an exploration of what can happen when we use music intentionally. It is a blend of clinical stories, research, and strategies, all designed for the person who is looking for ways to best use music to improve mood, decrease stress, improve learning, and transform lives regardless of age or ability. How to find the music that will help you change your emotional state in a short period of time…. Jennifer is a great story teller who effectively captures moments, making them fresh to the imagination. 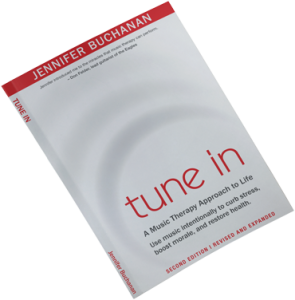 Presentations based on Jennifer’s new book TUNE IN (2nd Edition) are available in KeyNote, Seminar and retreat formats. Attend an upcoming presentation or our fall BOOK LAUNCH. We have complimentary resources that we want you to have!